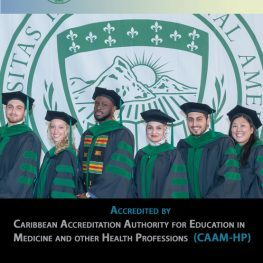 We are pleased to announce that The International American University College of Medicine (IAUCOM) was awarded accreditation by The Caribbean Accreditation Authority for Education in Medicine and other Health Professions (CAAM-HP). The decision was based on a their consideration of a large, complex multi-factorial proposal followed by a five day site visit conducted on the campus in St Lucia and Clinical campus in Baltimore. IAUCOM now has provisional accreditation status for two years (July 31, 2018 to July 31, 2020). CAAM-HP is the body authorized to determine and prescribe standards and to accredit medical schools in the Caribbean. It is fully recognized as a viable, comparable standard to the LCME by the US Dept. of Education’s NCFMEA, as well as the World Federation of Medical Education (WMFE). We are committed to continuous quality improvement and producing highly competent and dedicated physicians. We wish to thank the students, faculty and all members of IAU family for their support.